PlayLogic has released the latest patch for Knights of the Temple 2. In KOTT2 players will join the ultimate battle of Paul de Raque, Grand Master of the Order of the Temple and hero of the first game, and the forces of Hell. Travelling the lands and kingdoms of 13th century Europe, Paul must unveil the secret of three mysterious ancient artefacts and fight the demon armies attacking our world. A Grand Master of the Order of the Temple, Paul de Raque has fought many battles in the eternal war between Good and Evil. But now he faces his greatest challenge yet. Visions of evil forces invading our world, undead beings ravaging the peaceful lands of northern Europe and a dark menace opening a portal closed millennia ago. Fight your way through a forgotten Roman city, deadly dungeons of the Saracen empire, discover long forgotten islands, ruins and catacombs on a search for a secret hidden on the ground of an ancient underwater fortress. 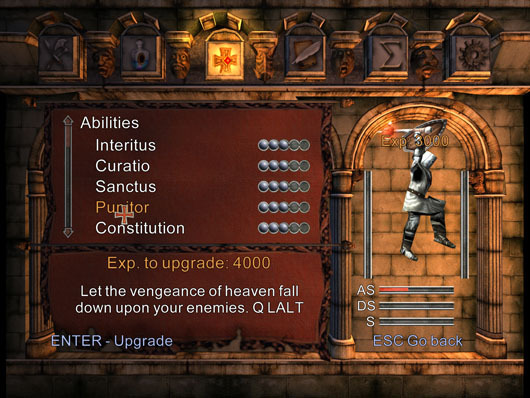 Knights of the Temple II is the sequel to last year's acclaimed Knights of the Temple, which followed the epic exploits of the young templar Paul de Raque in his battle against the demonic forces of Hell. our world, undead beings ravaging the peaceful lands of northern Europe and a dark menace opening a portal closed millennia ago. *Three different Multiplayermodes: Deathmatch, Teamdeathmatch and Capture the grail (PC version). looks lame to me. meh.